Join the discussion on our forums! Come discuss Doomcaller over in our dedicated Doomcaller discussion topic. Battlecry: Give your C'Thun +2/+2 (wherever it is). If it's dead, shuffle it into your deck. "Hello, is Doom there? No? Can I leave a message?" That flavor text is Warcraft 3 all over again. With how absurdly late this comes into play, it seems like it'd be balanced if it shuffled a C'thun into your deck regardless of whether one had died. Especially since transformation spells destroy it right now. It'd be a powerful late game to have multiple C'thuns, but since C'thun decks pretty much spend the game trying to get to a big late game play with a lackluster early game I think it'd be fine. Especially since a deck running this would be even slower. a) Your C'Thun being transformed with effects such as Hex, Polymorph, Polymorph: Boar or the Tinkmaster Overspark battlecry. b) Your C'Thun was stolen by cards such as Sylvanas Windrunner' deathrattle, Mind Control, Mind Control Tech battlecry, Entomb and Cabal Shadow Priest. c) Your C'Thun was burned due to overdraw, However if your C'Thun was returned from the board to your hand with effects such as Sap, Freezing Trap and Vanish while having a full hand (10 cards) It will count as C'Thun dying and the battlecry will trigger. If you already have a dead C'thun, and you steal your opponent's C'thun and use Doomcaller afterward, will the stats of the re-shuffled C'thun be from your dead C'thun or your opponent's C'thun? Your C'thun, C'thun stats are attached to the player and not to the card/minion. So what happens if you steal both an opponent's C'thun and their Doomcaller? When you play the Doomcaller, would it put a new C'thun into your deck? (Assuming you got the stolen C'thun killed). Some people just couldn't have understood the weight of this card. The basic idea is that although C'thun has enough power for a 'starter deck', its battlecry damage alone is not quite enough for a direct win. It can be easily seen that your chance of an easy C'thun win is dampened by enemy minions on board, whose health can be modeled. The model turns out to be that C'thun is still a little behind the competitive frontline. So the winning strategy offered by this card Doomcaller is essentially a second C'thun shot. Blizzard has thought about it, and thus this card in every template C'thun deck. The reasoning is good, whereas the card also turns out useful. But since some mainstream removals can void the shuffle-back effort, the whold C'thun system is still not robust enough for everything. Lost a few games because he didn't bring C'thun alive again... broken card anyway. Has anybody tried what happens when your C'Thun get stolenby Mind Control or Sylvanas, and then you kill it. Is it still 'your' C'Thun? From the interaction of N'Zoth I guess the answer is probably no, but just wondering. That's because technically, your C'Thun never died, it got milled. Same thing would happen if it was transformed (Polymorph, Hex, Recombobulator, Tinkmaster Overspark, etc) or mind-controlled. I polymorphed opponents C'thun today. He still got it back with Doomcaller. Wouldn't only one C'Thun be placed back in your deck since the requirements to put a C'Thun into your deck is no longer satisfied on the second trigger of the battlecry? Aka: C'Thun is already in your deck during the second activation of Doomcaller, thus no C'Thun is generated into your deck. No, i've actually had Brann shuffle two C'thun's into my deck before. All doomcaller checks is if a previous C'thun has been played and died. If its been milled or transformed then doomcaller doesn't trigger, but if a previous C'thun died then it triggers twice. 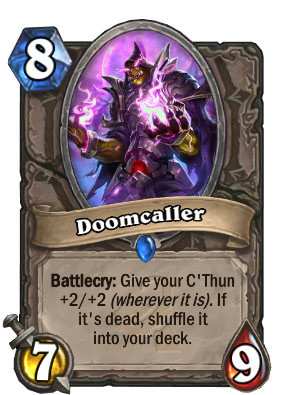 If his C'Thun is respawning with Doomcaller, then he has already played C'Thun. It stands to reason that Brann could be alive from before the first playing of C'Thun.